The outback is an amazing and adventurous destination that most Australians dream of exploring at least once in their lifetime. These incredible experiences and accommodation options will help to make your outback holiday everything you’d hoped for. Enter, the best of the outback: Northern Territory. Join Davidson’s Arnhemland Safaris to discover the holiday experience of a lifetime in a pristine wilderness environment where the Aboriginal presence encompasses more than 50,000 years. 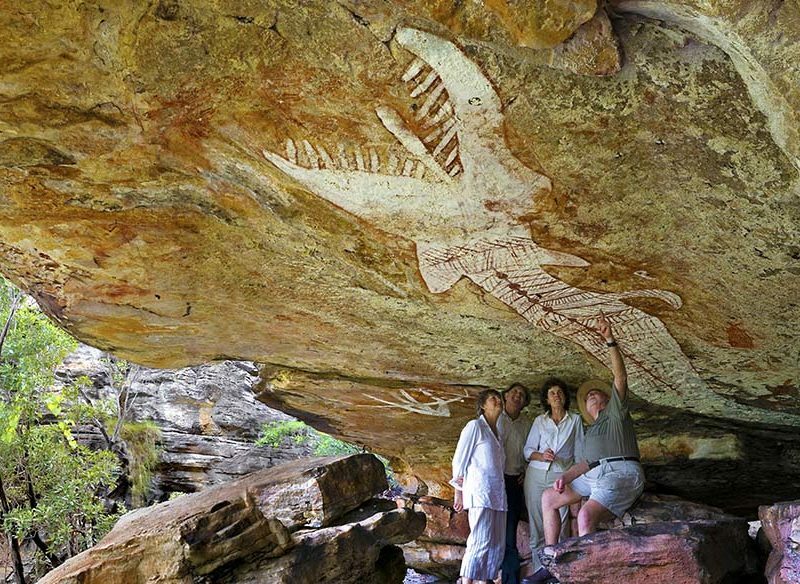 The high concentration of ancient rock paintings in spectacular galleries depict Indigenous history and aspects of the Dreamtime, the spiritual foundation of the Aboriginal culture. The well-appointed lodge is nestled amongst the remote tranquillity and pristine wilderness of Mount Borradaile, a region renowned for its unspoilt natural beauty, diverse landscapes and abundant fauna and flora. Activities include bird watching, billabong cruises, barramundi fishing, visiting rock art galleries, swimming in crocodile-free rockholes, bushwalking, 4WD adventure, bush tucker appreciation, photography, exploring catacombs, investigating paperbark swamps and rainforest, wildlife spotting and viewing the exotic flora in this fascinating ecosystem – or you can just lie back and relax in this peaceful environment. You will have the freedom to discuss your preferred activities with your guide who will advise you of your options and then accompany you to ensure you have a rewarding and memorable experience. It’s hard to put a finger on what makes internationally acclaimed artist Bruce Munro’s Field of Light at Uluru so affecting. It’s subtle and breathtakingly beautiful, all at once. It is completely overwhelming in size, yet invites immersion in its wondrous fantasy garden of 50,000 seeds of light, the spindly stems breathing and swaying through a sympathetic desert spectrum of ochre, deep violet, blue and gentle white. There are many ways you can immerse yourself in the Field of Light. A General Pass includes transfers and ample time to take in the exhibition; a Star Pass also includes sparkling wine and canapes. A Night at Field of Light includes sunset canapes and sparkling wine, a three-course dining experience, a star talk and time to take in the Field of Light. Pre-booking your tour is strongly recommended. The exhibition is open daily through 2019.
personalised tours showcasing the wonder of the region and once-in-a-lifetime Central Australian experiences. Visitors are awestruck by the iconic Uluru-Kata Tjuta National Park, amazed at the scenic landscapes of the West MacDonnell National Park, and enthralled by local flora, fauna and Indigenous culture, leaving them with a lasting impression of the region. as bush-camping overnight stays. VIP, private and small group classic tours are available. Delight in the sheer pleasure of boutique travel, with a range of journeys from 5 to 22 days to the most breathtaking and iconic locations in Australia and New Zealand. In the company of an expert Journey Director, guests can truly immerse themselves in the sights, sounds and flavours of each destination. Experience the majesty of the Northern Territory in luxury, travelling with a maximum of 20 likeminded guests, from the Red Centre’s natural wonders to the Top End’s vibrant floodplains and hidden waterfalls. It’s all possible with Inspiring Journeys’ unparalleled wealth of expertise to create unforgettable moments, unlocking every destination’s potential to create lasting memories through enriching experiences. The experts at Inspiring Journeys have ensured that all journeys showcase a raft of highlights that are authentic, engaging and off the beaten track. Walk through the beautiful West MacDonnell Ranges on the Larapinta Trail outside of Alice Springs on walks ranging from a three-day highlights experience to a 14-day traverse – self-guided or guided. Camp in swags under sparkling night skies or relax in comfort at award-winning and exclusive eco-friendly campsites. 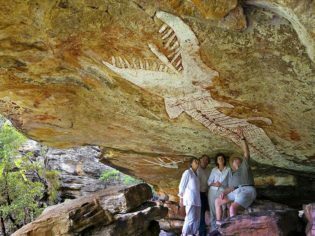 Further north, discover the Stone Country and Arnhem Land escarpment on the Jatbula Trail and the Kakadu Walking Adventure. Marvel at remote Aboriginal rock art galleries, walk to pristine waterfalls for a refreshing swim, spot teeming birdlife around the billabongs and learn about the area from our professional guides whilst camping under starry night skies. Surrounded by endless plains, rolling red sand dunes and an air of tranquillity, nothing can prepare you for the grandeur of the world’s most iconic monolith. A visit to the majestic landmark is filled with ancient culture, history and breathtaking surrounds. There is no shortage of memorable experiences worthy of an Uluru itinerary, yet you can experience the magic in as little as three nights, making it the perfect Australian weekend getaway or short break. There’s no accommodation or camping inside Uluru-Kata Tjuta National Park, so you’ll find Voyages Ayers Rock Resort just outside the park boundary. Within the Resort grounds, you’ll find cafes, restaurants, shops, art galleries and accommodation including five distinct hotels and a large campground, all conveniently just walking distance away from each other. The Resort offers guests complimentary return transfers to and from Ayers Rock Airport, as well as a free shuttle bus that circulates through the Resort daily, and a suite of complimentary Indigenous activities. If luxury and adventure are your two prerequisites for an escape, then look no further than Seven Spirit Bay. Fresh from a dramatic renewal, this iconic wilderness lodge is once again at the cutting edge of luxury outback experiences. Ideally situated in Garig Gunak Barlu National Park, Seven Spirit Bay straddles a stunning marine sanctuary and the pristine wilderness of the Cobourg Peninsula. The location allows for a host of extraordinary adventures by boat or 4WD, including fishing expeditions, sightseeing tours, wildlife safaris and more. Best of all, every adventure is led by a seasoned professional whose knowledge and experience will bring your adventure to life. Seven Spirit Bay’s five-star villas are both charming and unique. Spaciously dotted through the wilderness, each villa boasts water views and sea breezes, plus a host of other amenities. And, as the sun seeks the horizon each day, it’s only a short stroll to Wawidada Pavilion for sunset drinks and exquisite cuisine. I would add a Venture North tour to that list! !